K'ung Hsiang-Hsi (Kong Xiangxi, 1881-1967) was born in Taigu, Shanxi province to a well-established family of businessmen and educated by Christian missionaries. 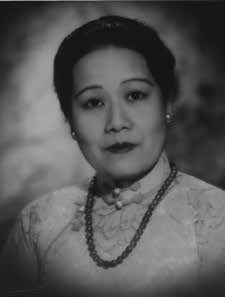 K'ung was a 75th-generation descendent of Confucius, and was a passionate advocate for education - having studied at Oberlin College and Yale University before returning to China in 1907. He helped to set up schools in his hometown of Taigu to fulfill his vision of strengthening China through education in the 1910s. K'ung's initial career as an educator was cut short by the political disruption caused by the fall of the Qing dynasty. He was quickly appointed the civil adminstrator of Taigu and division commander of the local army. 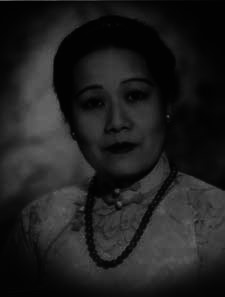 Shifting politics obliged K'ung to spend time in Japan, where he met and in 1914 married Soong Ailing (1890-1973), eldest of the three famed Soong sisters and eventually became the brother-in-law of Sun Yat-sen and Chiang Kai-shek. K'ung also engaged in business, trading internationally in kerosene and other natural resources through his Xiang Ji Company. 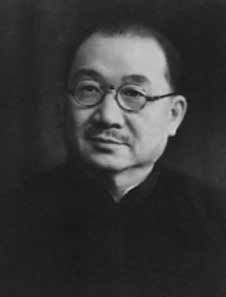 Additionally he served in several critical posts in the Republic of China government: Minister of Industry and Commerce (1928-1931), Minister of Finance (1933-1944), Governor of the Central Bank of China (1933-1945), and Premier of the Republic (1939-1945). During his career he enacted important economic reforms and was among the key architects of China's modern financial and industrial systems. As a highly educated and sophisticated businessman, K'ung enjoyed the resources and the aesthetic sensibilities to appreciate fine works of art. His pivotal role in the government and close connections with influential people in China and abroad also provided him with ready access to important artists and collections, allowing the family to assemble one of the most important collections of jewellery, jadeite, Chinese paintings and works of art in modern Chinese history. Notes: This gracefully proportioned and richly glazed vase is an imitation of Song dynasty vases of the same form which in turn are modelled archaic jade cong from the Neolithic period. 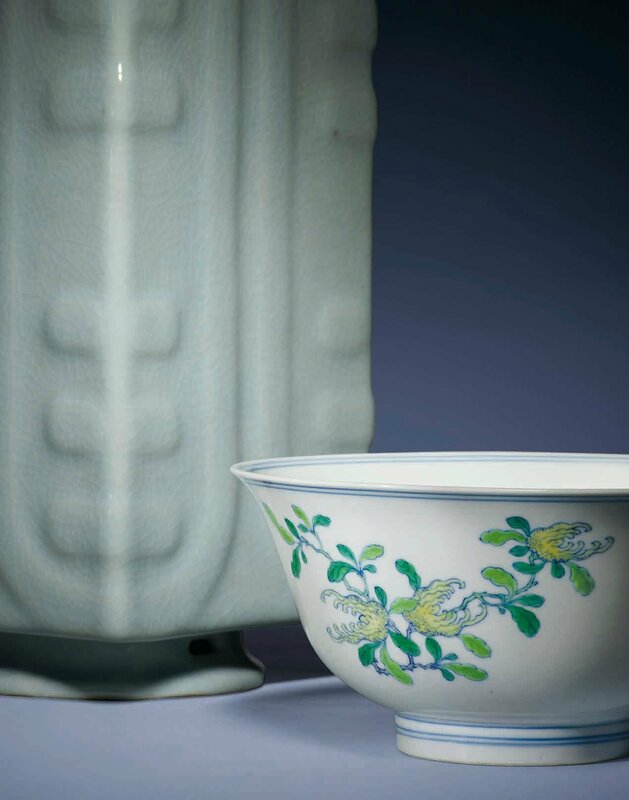 For a Guan vase of cong shape dating to the Southern Song dynasty, in the of Tokyo National Museum, refer to Oriental Ceramics, The World's Great Collections, vol. 1, Kodansha series, Tokyo, 1976, col. pl. 13. 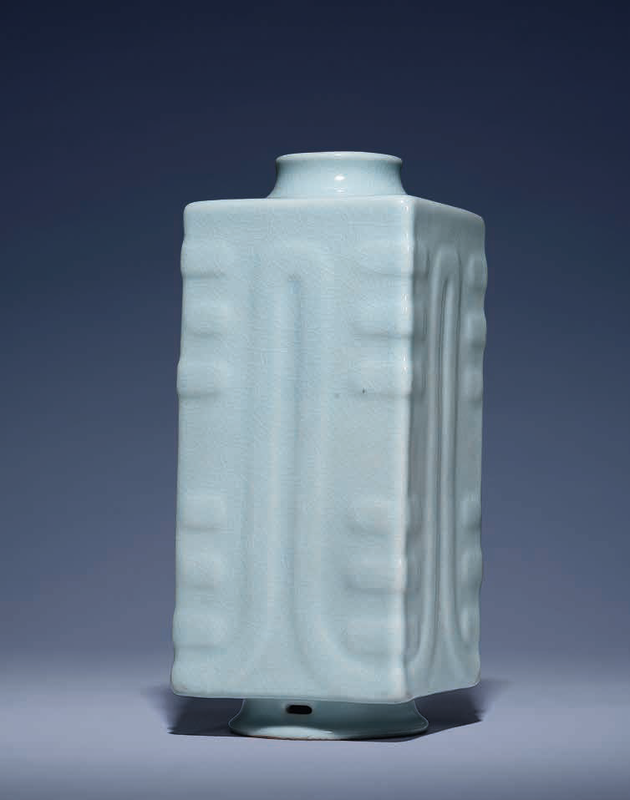 The present vase with its attractive greyish-blue glaze probably found its inspiration from the Northern Song Ru ceramics rather than those of the Southern Song Guan wares. The decorative form of the present vase, with its unusual moulded inverted U-shaped design on each facet and the additional apertures, is particularly rare. On many archaistic ceramic forms of the Qing period, perforations are applied on outer side of the circular foot in imitation of archaic bronze shapes, such as those found in Guan-glazed hu-shaped vases from the Song dynasty. It can be argued that for tall hu-shaped vases these apertures probably served the purpose of stabilising their slimmer profile, however, with the sturdier cong shapes this feature seemed oddly unnecessary. 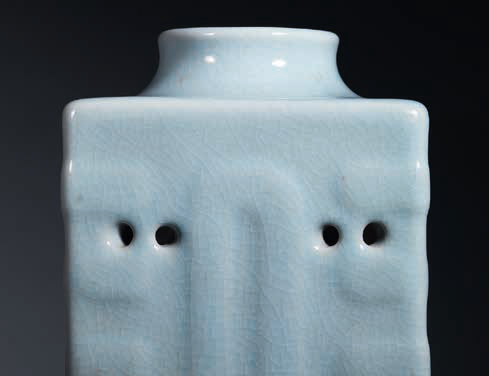 A comparable example of this exact same size and design, covered with a Ge-type glaze was sold at Christies Hong Kong, 29 April 2002, lot 665. 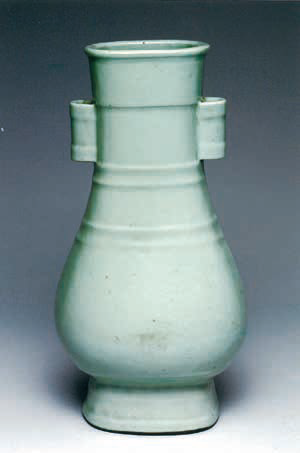 Two other Guan-glazed Qianlong-marked vases of this same moulded design are known. The first with perforations on outside of the ring foot, from the Carl Kempe Collection, was sold at Sothebys Paris, 15 December 2011, lot 98; and the other without any apertures was sold at Sothebys Paris, 7 June 2011, lot 197. 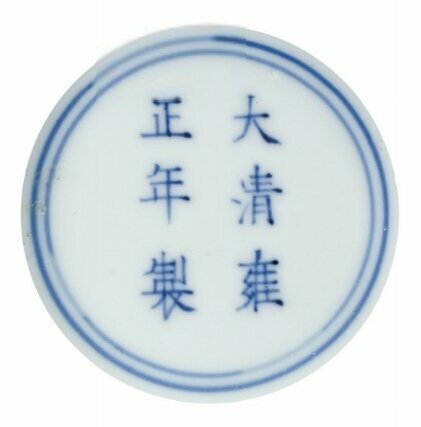 Related examples of cong-shape but moulded with trigrams are known such as the Qianlong-marked Ge-glazed vase illustrated by Peter Y.K. Lam, Ethereal Elegance, Porcelain Vases of the Imperial Qing, The Huaihaitang Collection, Art Museum, The Chinese University of Hong Kong, 2007, pp. 172-173, no. 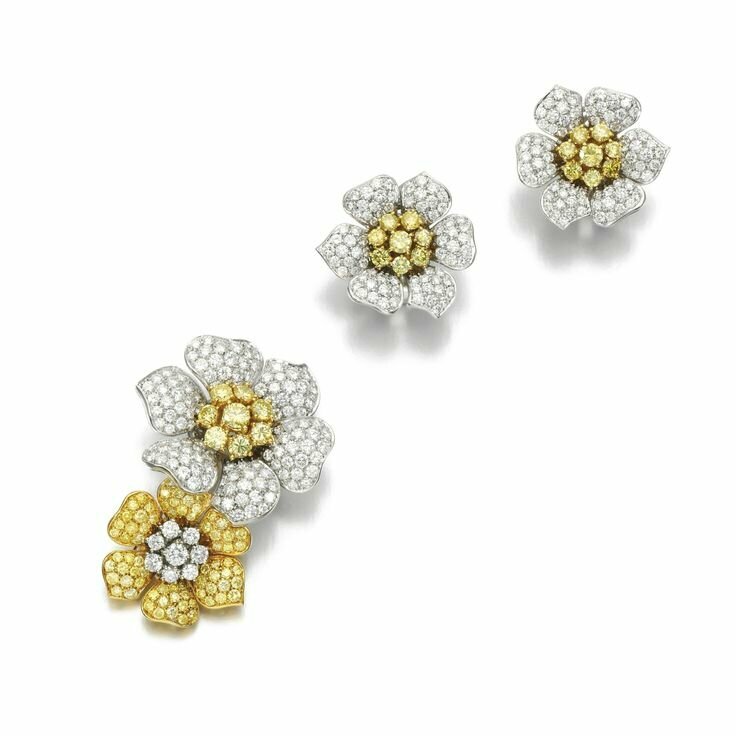 45; and an another from the Edward T. Chow Collection, was sold at Sothebys Hong Kong, 19 May 1981, lot 503. The bowl is finely potted with rounded sides rising to the gently everted mouth rim, delicately painted on the exterior with enamels in underglaze-blue outlines to depict three fruiting and flowering sprays of pomegranate, lychee, and finger citron, all together forming the auspicious sanduo, Three Abundances. The interior medallion has a leafy cluster of two peaches in shaded apple-green and iron-red, within double lines repeated below the rim. 6 1/4 in. (15.9 cm.) diam. Property from the family of K'ung Hsiang-Hsi. Notes: Yongzheng-marked bowls of this pattern are extremely rare and only very few examples are known, including a pair sold at Sothebys Hong Kong, 15 May 1990, lot 286; and the other pair from the collection of S. C. Davis (1871-1940), sold separately at Sothebys New York, the first bowl sold on 27 November 1990, lot 190, and the other, sold 26 November 1991, lot 356; and a pair sold at Christies Hong Kong, 29 May 2007, lot 1366. It is interesting to note the unusual stippling of effect of the iron red in the portrayal of the ripened peach fruits on the interior. 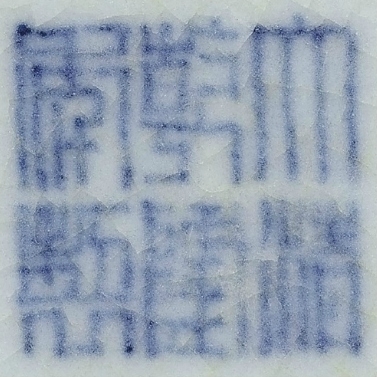 This method probably started in the late Kangxi period, and can been seen on the peaches of a Kangxi-marked doucai bowl from the Palace Museum, Beijing, illustrated in Qingdai Yuyao Ciqi, Beijing, 2005, p. 126, no. 32. 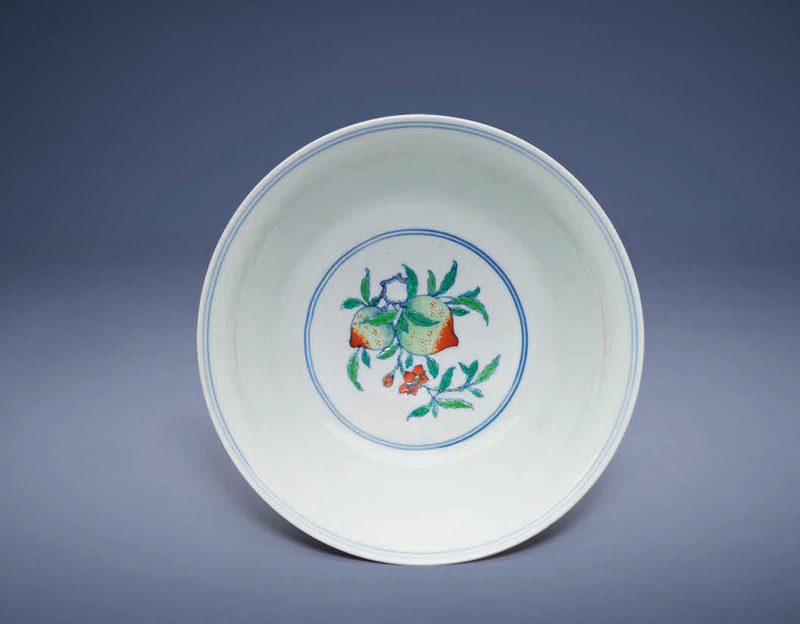 During the Yongzheng period, the doucai technique was further enhanced with the addition of the famille rose enamels, enriching the colour combinations and texture of the decoration, as exemplified on the current bowl. Commentaires sur Two masterpieces from the property from the family of K'ung Hsiang-Hsi at Christie's Hong Kong, The Imperial Sale.